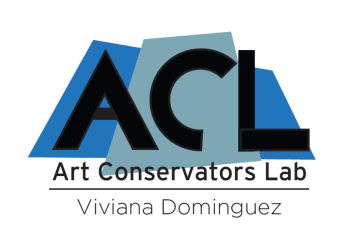 Viviana Dominguez - Art Conservators Lab. Time is of the essence when it comes to responding to disasters. Art Conservators Lab is ready to help whenever catastrophe strikes. Our Art Conservator team is trained for Emergency Response Recovery of Collections and will assist you promptly. The Lab’s conservators are specially trained in the treatment of artworks of all types such as paintings, works on paper, sculptures and textiles. We will also put you in contact with the best professional art handlers. Calamity never strikes at a convenient time. Decide now how you would respond if an emergency imperiled your precious collection, and go with an enterprise that’s hurricane-tested, trusted, and willing to jump on a plane at a moment’s notice. As a member of the National Heritage Responders (NHR) Viviana Dominguez assisted the Vizcaya Museums and Gardens after Hurricane Irma in 2017. She documented the building and collection damages produced by the storm, removed salts from objects and helped to dry curtains and drapery. Dimitra Pantoulia, objects conservators, assisted on this project as well. Viviana Dominguez is a member of National Heritage Responders (NHR). She worked in Haiti after the 2010 devastating earthquake in Port-au-Prince, Haiti, and was one of the first responders after Superstorm Sandy in New York where she coordinated the recovery of Martha Graham costumes and theatre props. The National Heritage Responders (NHR) responds to the needs of cultural institutions during emergencies and disasters through coordinated efforts with first responders, state agencies, vendors and the public. Volunteers can provide advice and referrals by phone: 202.661.8068. Requests for onsite assistance can be forwarded by volunteers to the NHR Coordinator and Project Director for response. Less urgent questions can also be answered by emailing info@conservation-us.org. The Smithsonian Institution contracted Viviana to conserve and oversee the paintings conservation activities at the SI Haiti Cultural Recovery Program. The program is an international initiative sponsored by the Smithsonian Institution to recover the art damaged during the 2010 earthquake in Port-au-Prince. During nineteen months the team has recovered around 30,000 works of art, documents and books including the Voudou sacred objects collection. Viviana has trained local artists to accomplish the conservation of paintings at the SI center and mural painting at the Holy Trinity Episcopal Cathedral.